IHG Rewards Club has launched new Q1 Accelerate-promotion that is valid for stays between January 1 – April 30, 2018. Members have personalized offers based on their recent stay history with the chain. There are various hurdles and members can also earn completion bonus. Remember to post your offer to the comment section below! This offer is almost identical to the one I have for the current quarter with slightly lower bonus. Essentially, I would earn roughly 2,000 bonus points per night if I complete the hurdles. You must be an IHG® Rewards Club member and must register your member number in advance to participate in “Accelerate” (“Promotion”). Upon Registration (as defined below), members will be presented with the opportunity to earn at least 30,000 bonus points upon completion of all offers presented. By clicking “one click registration” you are registering for Accelerate and agreeing to receive IHG Rewards Club marketing communications and the terms and conditions of the Campaign and Privacy Statement. Members will be awarded bonus points listed for each individual Promotional offer (“Offer”) after completing the requirements of each individual Offer. Each Offer must be completed between 1 January 2018 and 30 April 2018 (both dates inclusive) (“Registration”). The bonus points earned through individual Offers can be used for redemption opportunities towards Reward Nights, merchandise and other redemption opportunities. See individual Offers for the specific terms and conditions per Offer type. A Stay is defined as per IHG® Rewards Club Membership Terms and Conditions as one night or consecutive nights at the same hotel, regardless of frequency of check-in/out (“Stay”). A Stay constitutes a “Qualifying Stay” when member pays qualifying rates, which include most business and leisure rates at InterContinental®, Crowne Plaza®, Hotel Indigo®, Holiday Inn®, Holiday Inn Express®, Staybridge Suites®, Candlewood Suites®, Kimpton®, EVEN® or HUALUXE® hotels worldwide. Bonus points are not issued for Non-Qualifying Room Rates or Non-Qualifying Stays. “Non-Qualifying Room Rates” or “Non-Qualifying Stay” include the following: net wholesale individual and group rate, certain package rates, employee discount rate, friends and family rate, crew rate, special discounted contract rates, seasonal worker/crew rate, 50% travel club discount rate, travel industry discount rate, distressed passenger rate, IHG® Rewards Club Reward Nights/Airline Hotel Reward rate, rates booked through third party web sites, complimentary hotel Stays and any other rates not defined as a Qualifying Room Rate at IHG’s sole discretion. Only one room per member per Qualifying Stay will be awarded the applicable bonus points, or other benefits (if any) available under the applicable Offer. If more than one member checks into the same room, only one member is eligible for the applicable bonus points, or other benefits (if any) available under the applicable Offer. Each Promotion Offer of bonus points is available only once to each member. 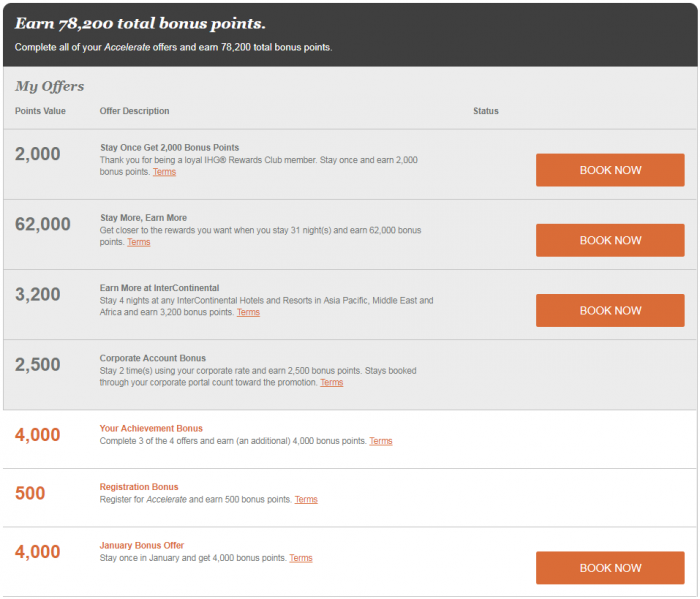 IHG Rewards Club Members with a Miles earning preference will earn Points. No retroactive bonus points will be awarded for Stays prior to Registration. Except as otherwise stated in the terms and conditions, please allow up to 2 to 3 weeks for Promotion Offer bonus points to be credited after checkout. This Promotion is subject to standard IHG Rewards Club Membership Terms and Conditions and earning structure, which can be obtained by visiting www.ihgrewardsclub.com. The use of certain rates may be subject to applicable agreement(s). Any misuse of such rates is considered a fraud activity subject to IHG Rewards Club Membership Terms and Conditions. IHG reserves the right to remove a member’s bonus points or cancel a member’s account if fraudulent use of the Promotion is detected. To the extent permitted by applicable law, IHG® Rewards Club reserves the right to cancel, suspend and/or modify the Promotion/Offer at any time with or without notice. To the extent permitted by applicable law, IHG reserves the right of final interpretation of this Offer. Members must make any promotional inquiries by 60 days from the end of the campaign promotional period. Previous articleReader Question: American Airlines Flight Delay Ex-Europe When On Award Ticket – Any Compensation?